Dealing with a car that just won't start up due to weather, collision, or electrical issues? With just one call, our towing specialists will be there to take the vehicle back to our shop for repair services. You'll appreciate our affordable towing services and our guarantee that your vehicle makes it back to our shop safely. For fast towing services, contact us at 828-689-2501. With our 24-hour towing service you can have your car towed any time of the day and taken back to the garage for repair services. In case your car or a car you are driving is disabled, contact 828-689-2501 for professional around the clock towing services. We boast well-maintained tow trucks, and highly trained and certified drivers who are committed to providing professional and courteous services to all our customers. AAA (or Triple A) is a federation of motor clubs. The federation includes over 8,000 auto shops throughout the US and Canada. AAA only approves repair shops and towing companies that meet their strict standards. 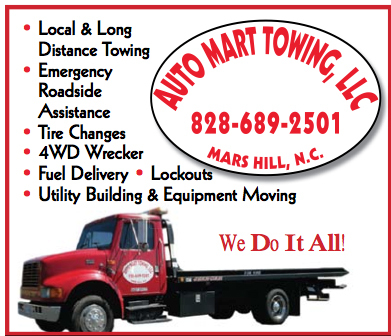 Auto Mart Towing is a AAA Approved Towing Company! This means that you can expect high-quality towing services. Also, auto repair work from Approved Auto Shops comes with a guarantee for 12 months or 12,000 miles. When it comes to towing, different car models and situations call for different approaches and type of trailers used. For instance, if your car has become completely disabled, the most appropriate towing trailer is the flatbed trailer where the disabled car rides atop the trailer. Flatbed towing is one of the safest ways to transport a car. We offer professional flatbed towing services. With the service, we can guarantee you that your car makes it back to our shop safely. Give us a call today at 828-689-2501. We offer large vehicle towing services. Our towing trailers are capable of towing even the largest vehicles. With this service, we ensure the safety and security of your truck, trailer, and cargo. Give us a call today at 828-689-2501. Auto breakdowns are often unavoidable - this is regardless of how new your car is or how carefully you drive. When your car breaks down, the best option is to have it towed to a professional auto repair shop for repairs. This way, you can be back on the road as quickly as possible. To have your broken down vehicle towed to a quality auto shop for repairs, contact 828-689-2501 today. At Metco Tire & Auto Service, we have a 'towing to shop only' service whereby we tow your disabled car to our auto shop for repair. Wheel-lifts are devices used for towing vehicles by lifting one end of the towed vehicle by the wheels. Because they position the load further back than tow slings do, they help eliminate the risk of damage to modern vehicles that use plastics, air foils and other aerodynamic styling features. You can trust the towing experts to tow your car or truck safely and without damage. Call us at 828-689-2501 when you need assistance.